Thanakorn 'Gob' Hoontrakul and his wife Goya, are the owners of five-star luxury resort, The Tongsai Bay on Thailand’s island of Ko Samui. The Tongsai Bay first opened its doors in 1987 after Thanakorn’s father Akorn saw the beautiful private bay from the sea and declare that it was ‘love at first sight’. After purchasing the land Akorn designed his new luxury resort with a dedication to protecting the environment and to cause no damage to the wildlife. In fact, no tree was chopped down while designed the resort, they simple built the resort around what was already on the land. When Akorn passed away in 2000 he passed managing the resort to his son and daughter-in-law. Luckily both share Akorn’s passion for the environment. Thanks to their hard work and with their vast knowledge of Thai hospitality and service, their innovation and passion for the natural world, The Tongsai Bay remains a family-owned resort and continues to welcome guests from around the world – just as Akorn wished. Here The Luxury Travel Bible talks with Thanakorn to discover how the resort reduces its impact on the environment and how can luxury travellers reduce their impact. And believe us, his passion for making the world a greener place is infectious! 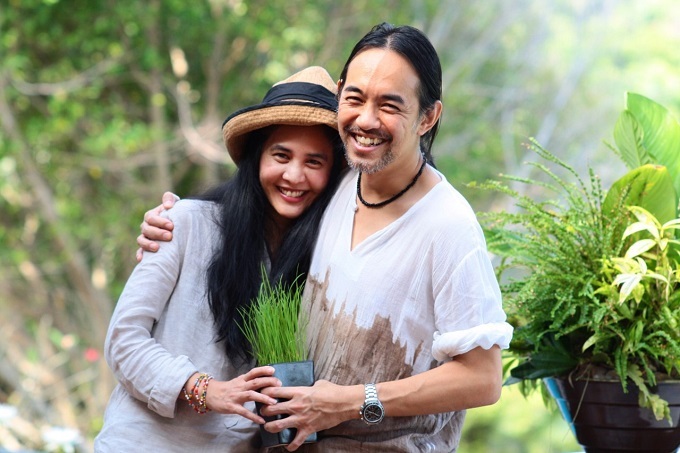 Thanakorn 'Gob' Hoontrakul and his wife Goya, owners of The Tongsai Bay, Koh Samui. What inspired you get into the luxury travel industry? Tongsai Bay is a family business. My father started the development back in the 80’s and passed away in 2000 by which time my wife and I took over. Our task was to keep up with the changing time and environment. What is the single best/defining thing about Tongsai Bay? It’s a hotel that allows animals to share their unconfined habitat with humans. A Slow Loris has been spotted as early as May 2018 in the hotel ground. More than 60 kinds of birds have been reported seen over the years. With nature conservation in mind, we do not use insecticides, pesticides or any chemical agents in our grounds. Guests should feel that it is genuinely natural. What are you most proud about at Tongsai Bay? Apart from having many repeaters return every year, I suppose I’m proud of the fact that we stay true to what we believe. We don’t “fumigate” mosquitoes and other insects just because guests complain about mosquitoes, for example. If we fumigate mosquitoes, other insects will also be poisoned and then the whole food chain will be poisoned resulting in less and less numbers of birds, reptiles and also mammals that call Tongsai home. We don’t use plastic bottles in guest rooms and Food and beverage outlets to reduce non-biodegradable waste. We use lemongrass straw instead of plastic straw. All the efforts that we put in to run a hotel as environmental friendly as possible hate been appreciated more than frown upon. That makes me proud. There is so much beautiful wildlife on Tongsai Bay, please tell us more about your policies and beliefs towards it. Compared to the main land, wildlife and bio-diversity on Koh Samui as an Island is limited but with the Island turning more and more commercial it is much more crucial to preserve whatever left that is natural. At Tongsai it is visibly natural since we do not develop every inch of the hotel into man made structure. There’s always plenty of natural space. We think about what is enough. To stay small and different may be more rewarding than to grow business-wise and become a large corporation. Being small does have its disadvantages in a competitive world but we have survived for 31 years without debts. So the rationale is about making enough profit to keep it worthwhile to run a hotel that is friendly to nature. There’s an importance placed on the ratio between nature and man made. And if nature is scarce then more and more it will become the new Luxury unless every hotel turns to nature conservation then it will be too common to be Luxury. But then again the world will have much cleaner air. Bio-diversity will be maintained and animals may not become extinct. What does Tongsai Bay do to reduce its environmental impact? As have mentioned in questions above, we don’t use chemicals in natural grounds in order to keep the food chain chemical-free. We want to share our ground with animals but at the same time we are totally against animals in captivity or forced labour so buying an animal to be set free at Tongsai is a no-no. A place with wild animals sharing the ground means it’s rich enough and safe enough for animals to live in. So we act like a refuge or an oasis, for some wild animals if you like when around us forest have been cleared to make way for developments. We try to reduce non-biodegradable waste to a minimum starting from purchasing department. Non-biodegradable waste, if not recycled are landfilled or burned - either way it leaves an impact on the environment in the soil or air. The best way is to reduce or eliminate non-biodegradable waste from the source by using recyclable product or bio-degradable product. For example using glass or aluminium over plastic when it comes to bottled water, soft drinks etc. Bio-degradable waste including food waste will be made into fertilisers. Some like pineapple and lime peel are used to make enzymes that we make for housekeeping to clean the bathroom (reducing chemical usage too). We now try to reduce the use of hard wood in open air area especially when it is difficult in Thailand to find hardwood that is certified “commercially grown” therefore reducing illegal deforestation. This will involve substitution of hardwood with cement, artificial wood or commercially grown wood e.g. the deck of Polad Beach Bistro is made of pinewood from New Zealand. What can luxury travellers do to reduce their impact on the environment while travelling? Try to be efficient on their holiday or leave as little waste as possible e.g. don’t leave air-conditioner on if they are not in the room. Don’t spend on activities that exploit wild animals like going to a zoo or aquarium or elephant riding. There should be a limit to entertainment; riding an elephant, going to a circus or trophy hunting are just cruel and supports the wildlife trade. Go to places where animals are free to roam and not made to work for your money. I hope and think that it will be natural and local instead of artificial and corporate. What is your personal litmus test for whether a hotel is worthy of the 'luxury' tag? Personally, it must give you choices. Luxury for me is to be able to choose. It’s got to be responsible for mother nature and sometimes it’s got to be creative and unique. It must not be rushed or pressured but afford time to reflect. Our recent trip to Gangtey (Pobjikha) in Bhutan was rough to get there but rewarding once arrived. We stayed at Gangtey lodge - small, intimate, friendly and luxurious. The walk leading up to the marshes to see the Black necked Crane was unforgettable. A watch, spectacles and money. Who would you most like to sit next to on a long-haul flight? Why? I’d sit with someone I know well so that I don’t have to excuse myself a lot. Like my wife. What is the most important thing (travel-wise) that money CAN buy? Travel Insurance or anything that saves your life like a helicopter trip out of trouble to a hospital.